Coming up with a creative holiday gift idea is a lot like trying to hit out of a deep sand bunker … with a driver. Every December you try to think of something unique with which to surprise your spouse, friend or family member, and every year you seem to fall woefully short with the same old tie, perfume or ugly sweater. If you really want to blow them away this year, step up to the tee box and take a swing at a golf vacation with a big red bow. 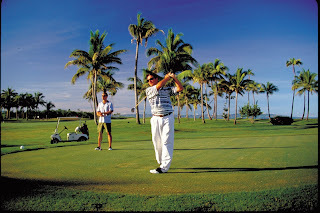 From the most casual golfer to the most dedicated duffers, everyone can have a great time both on and off the course at many of Let’s Golf’s great golf destinations. Will you surprise them with be a Gulf Shores Golf Package? Or a West Virginia Resort? Or send them to Florida to play on a PGA golf tournament site? Or to Smoky Mountains of Tennessee to experience a real mountain golf getaway? Having trouble deciding between the championship golf courses, Cajun cuisine and casino resorts of Southwest Louisiana or the laid back Grand Strand golf locale (also called Myrtle Beach golf lite) of Brunswick Islands of North Carolina, with it’s Calabash seafood, beachfront hotels and challenging golf courses? That’s a tough one. But don’t forget to consider the great value of a Kentucky State Park golf resort or South Carolina’s inland golf capital of Santee. And there’s more casino action all around Mississippi, with the links in Tunica and the historic golf in Biloxi set to wow them. Or they may have both Alabama’s Robert Trent Jones Golf Trail and Harbourtown at SeaPines on Hilton Head Island on their golf getaway bucket list, but they can only visit one at a time, so choose wisely and forget about the endless hours of shopping for that special gift. The perfect present can be found by visiting our state and destinations pages here. Happy Holidays!